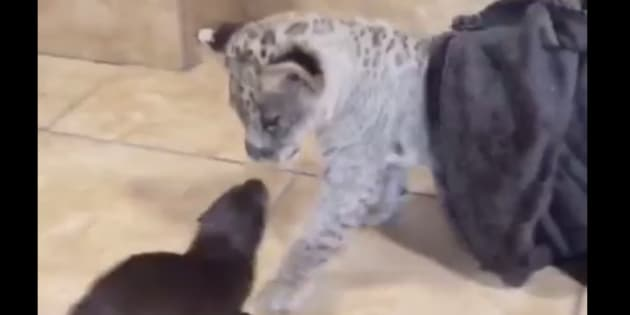 This lion cub and otter couldn’t be any more different. But people do say that opposites attract, and they’ve reportedly become fast friends at the Zoological Wildlife Foundation in Miami, Florida. Video going viral shows the curious otter approaching the cute cub, who’s tangled up in a blanket. After freeing itself from the fabric, the feline begins playfully stalking its new pal ― who repeatedly leaps out of the way in what appears to develop into an impromptu game of tag. “This video is way too cute,” the ZWF wrote on Facebook Sunday. While the video is indeed cute, the privately owned organization that posted it has been criticized for its conservation practices. PETA reported in March that the business had been cited seven times for violating the federal Animal Welfare Act. Animal welfare groups also widely condemn the petting and handling of big cat cubs in captivity, something the foundation allows.